Do you sometimes find it difficult to make yourself understood – even though you know you are using the correct English? Do you find it hard to understand mother-tongue English speakers? Are you anxious about having phone conversations in English? Working on your English pronunciation is a way to solve all these problems. Perfect pronunciation isn’t necessary to make yourself understood in English, so we will focus on the key areas that will improve your ability to communicate in English – speaking it and understanding it – and on the most common pronunciation problems for Italian speakers. A few years ago I went on holiday to Seattle in the US, and I needed to make a phone call. The public phone box only took 25c coins, called ‘quarters’, so I went into a shop to get some change. She looked at me, mystified. Finally, I realized that she couldn’t understand the way I was saying ‘quarter’, with my British English accent. The American English pronunciation of this word is very different. To hear the differences between the UK and US pronunciations, go to the online Cambridge dictionary entry for ‘quarter’: click on the speaker icons under the word to hear the different pronunciations. I had to put on my best American accent to make myself understood. The problem was that I expect the word ‘quarter’ to sound a particular way, and the American cashier expected it sound another way. I felt a bit ridiculous when I had to adopt a different accent, but the important thing is that I solved our communication problem. Have you had this kind of problem when you’ve been speaking in English? Do you sometimes expect a word to sound a particular way, and discover that its pronunciation is very different? Learning how to pronounce sounds, words and sentences correctly is just as important as learning the grammar of the language. Every time you learn a new word or phrase, you need to pay attention to spelling and pronunciation. This article will help you understand what pronunciation is, how it affects you, and some strategies for mastering the key areas. In the first part of this article, we’re going to look at the sounds that make up language, and in the second part we’ll focus on word stress and sentence stress. Part 3 will give you some practical tips and ideas for making rapid progress with your pronunciation. The individual sounds in a word are called phonemes. We produce a lot of different sounds when we speak, and these sounds are often very different between one language and another. b) which sounds are the most challenging for you to make and to understand. In this section we’ll look at some ideas and tools to help you understand sound systems in languages, particularly in English. The yellow arrow on the image below is pointing at the first feature, a speaker icon which will play the word for you – in both a British English and American accent. This is useful up to a point: the word ‘resource’ contains a vowel sound that doesn’t exist in Italian – the same sound that’s contained in the words ‘more’ ‘door’ ‘saw’ and ‘four’. This sound is represented by the symbol /ɔ:/. The second helpful feature of this dictionary is a phonetic transcription of the word, shown by the green arrow. Don’t be afraid of the phonetic alphabet – it doesn’t take long to learn to make sense of it. 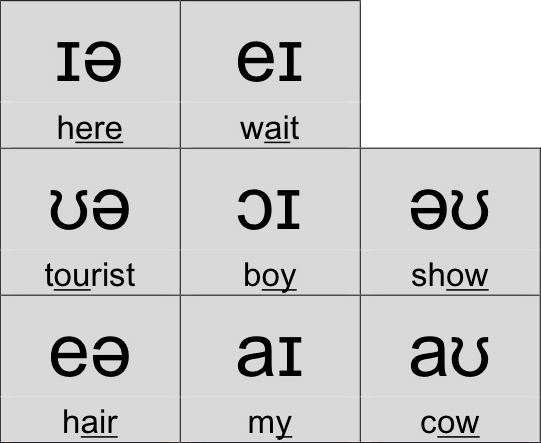 Even if you’ve never read phonemic transcriptions (words written in the phonetic alphabet to show how they’re pronounced) before, by the end of this article you will understand how to read them. There are 26 letters in the English alphabet, but there are 44 sounds in British English (there are 40 sounds in the Italian language). The sounds of a language are represented by symbols, like the normal alphabet. Some of the symbols are the same as the normal alphabet, like /r/, /s/, /k/, and some are different, like /ɔ:/, /əʊ/ and /θ/. 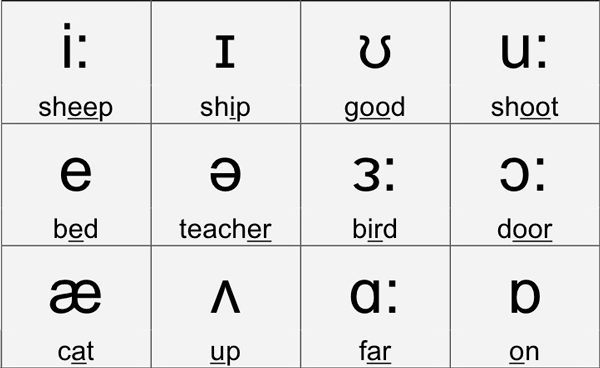 If you’d like to learn more about the symbols and the sounds they represent, check out this complete English phonemic chart – you can click on each symbol to hear the sound it represents. There are sounds in the English language that don’t exist in Italian, such as /θ/ in ‘thin’, /ŋ/ in ‘doing’, /ɔ:/ in ‘more’ and /ɜ:/ in ‘work’. The BBC website has some useful videos to help you pronounce all the different sounds in English. Click on these links to hear the pronunciation and for a short demonstration video for /θ/ in ‘thin’ , /ŋ/ in ‘doing‘ , /ɔ:/ in ‘more’ and /ɜ:/ in ‘work’ . There are sounds in the Italian language that don’t exist in English, such as /ʎ/ in ‘aglio‘, /ɲ/ in ‘lasagne‘, /ts/ in ‘forza‘ and /dz/ in ‘zero’. If a sound doesn’t exist in your own language it can be hard to hear it. The different sounds are either vowels or consonants. There are 20 vowel sounds in English and 24 consonants. In Italian there are 7 vowel sounds and 24 consonants. We make different vowel sounds by varying the shape of our mouth. We make different consonant sounds with our tongue, teeth, lips, palate, nose and vocal chords. We use about 72 different muscles when we speak. Each phonemic sound requires different muscles. If a sound doesn’t exist in your language, it can feel strange when you try to make that sound. This is because you use different muscle combinations. There are three types of vowel sounds in English: short, long and diphthongs. Diphthongs are a combination of two vowel sounds: /ɔɪ/ as in ‘boy’, /eə/ as in ‘wear’, /ɪə/ as in ‘near’ and /əʊ/ as in ‘home’. Note: in Italian diphthongs, for example ‘noi‘, ‘sei‘ and ‘lui‘, you can hear each vowel sound distinctly and separately, so there are two vowel sounds. In English diphthongs there is only one sound. Consonants can be voiced or voiceless. The only difference between the sounds /d/, as in ‘down’, and /t/ as in ‘town’ is that our vocal chords vibrate when we make the sound /d/, and don’t when we make the sound /t/. It’s the same difference between the sounds /v/ and /f/, and /z/ and /s/. Why is voiced or voiceless important? Because, for example, in the Italian words ‘smalto‘, ‘slitta‘ and ‘snaturato‘ you use the voiced /z/ . In the English words ‘snail’, ‘slow’ and ‘snap’ we use the voiceless /s/ . Try saying the Italian words and then the English words. These BBC Learning English videos explain voiced and voiceless consonants and the difference between /s/ and /z/ . There are 6 things to focus on with phonemes: the alphabet, understanding different English accents and 4 pronunciation traps. English spelling is hard. Italian has a very clear relationship between the spelling and the sound of the word – English doesn’t. You’ll be happy to know that spelling is a huge problem for mother-tongue English speakers as well! ‘The Chaos’ is a famous poem about the challenges of English spelling and pronunciation, written by Gerard Nolst Trenité in 1922. I don’t recommend you read it (some of the English is quite archaic; if you really want to read it and hear it ) but it shows a lot of typical problems with English spelling and pronunciation. There are also words with more than one meaning, such as ‘tear’, which means ‘strappare‘ /teə/, and ‘lacrima‘ / tɪə/, and changes pronunciation according to the meaning. Mother-tongue English speakers spend a lot of time spelling words to each other, names, surnames, addresses, email addresses, etc., not just over the phone, but face to face as well. It’s very important to learn the correct pronunciation of the English alphabet so you can do this too, and avoid misunderstandings. It’s always a good idea to check the spelling of names and addresses carefully. When you say the English alphabet, pay particular attention to the pronunciation of the vowels (a, e, i, o, u), to the letters that aren’t in the Italian alphabet, (j, k, w, x, y), and to the letter R, pronounced ‘aahhhhh’ in British English (more about this below). NOTE: there are one or two differences in pronunciation of the single letters between British and American English. Brits say ‘zed’, Americans say ‘zee’. Americans pronounce the /r/ sound in the R. It’s fine if you do too. Here is a good video showing the differences between the American and the British pronunciation of /r/. 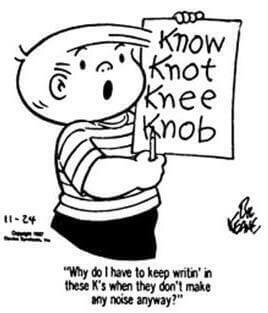 It doesn’t take long to learn to pronounce the alphabet correctly. It’s a good idea to take the same approach to memorising the English alphabet as you did to learning your multiplication tables when you were a child: repeat it until it sticks! There are many different English accents, with different vowel and consonant sounds. The ‘disappearing R’ is a peculiarity of the standard British accent, for example, but not of all British English accents. So what is the point of focussing on the standard British accent if it’s not going to help you understand American, Australian or Scottish accents? a) If you pay attention to pronunciation it becomes easier to understand English in general, and to hear the differences between the different accents. Fonetiks will show you, through recordings and exercises, how to pronounce and understand different types of English accent, including Irish, Scottish, Welsh, South African, Australian, Indian and Canadian accents. c. The best way to understand English is to listen to it as much as possible by, for example, watching TV programmes in English whenever possible. We will look at this more below. If you try and pronounce English words according to the way they are spelled, as if they were Italian words, you will make it very difficult for people to understand what you’re saying, and you’ll find it impossible to understand mother-tongue speakers of English. When you learn a word in English, focus first on how to pronounce it – and then only after learn how to spell it. Let’s look at the word ‘Wednesday’. This word, like many others in English, has letters that you don’t pronounce. It’s pronounced /’wenzdei/. To hear the pronunciation follow this link and click on the ‘listen’ icon. There is no /b/ in ‘climb‘, or any /p/ in ‘cupboard‘ and ‘receipt‘. As mentioned earlier, it’s hard work speaking another language, forcing your face into new shapes to make new sounds. One big difference between English and Italian is the way consonants go together. Italian words tend to end in vowel sounds. English words often start and end with consonants. It’s difficult for an Italian speaker of English to put all those consonants together without introducing some vowel sounds. Take the word ‘equipment‘, /i’kwipmənt/, for example. You will probably want to insert a vowel sound between the P and the M, and possibly after the T, making it ‘equip-a-ment-a’. ‘Apartment‘, /ə’pa:tmənt/, becomes ‘apart-a-ment-a’. It’s actually quite difficult for native speakers of English to pronounce all of the consonants in these words as well, but we don’t introduce vowel sounds – native speakers will not pronounce the consonant before the M, so it will sound like ‘equi-ment’ and ‘appah-ment’. This is one of those little things that has an enormous impact on other people’s perception of how well you speak English. If you can remember to eliminate these intrusive vowel sounds, your English will sound twice as good. How do you pronounce the words ‘early’, ‘mountain’ and ‘country’? You are probably mispronouncing the vowel sounds. ‘Early‘ is pronounced /’ɜ:li/, ‘mountain‘ is /’mauntin/, ‘country‘ is /’kʌntri/. In each case the vowel sound is very, very different from what you expect from the spelling. When you see two vowels together, you will probably try to pronounce all of the vowel sounds. However, in English we have four types of vowel sound, three of which we’ve already mentioned: long, short and diphthongs. The fourth is the weak form, represented by the symbol /ə/, and is the shortest, weakest vowel sound in the alphabet. To understand the function of this sound we need to talk about word stress – more about that later. There are 7 different vowel sounds in Italian, but in English there are 24 vowel sounds, most of which don’t exist in Italian. It is probably very difficult for you to hear the differences between them – although they’re quite clear to English ears. It’s useful to do some specific listening exercises, called ‘minimal pairs’ exercises to learn to distinguish between the different sounds, for example in the words ‘egg’, ‘cat’ and ‘cup’. You can find a lot of exercises on the internet, for example, on the BBC website, and at Fonetiks. Remember to check the pronunciation of the words and phrases you learn in English – even the ones you think you know. The R is nearly always pronounced in many regional British and Scottish accents, and in most American accents, so it’s fine if you want to pronounce all the Rs in English. However, in standard British English pronunciation we mostly don’t pronounce the R when it appears after a long vowel sound or diphthong, or at the ends of words. ‘Warmer’ is /’wɔ:mə/, ‘girl’ is /gɜ:l/, ‘early’ is /’ɜ:li/, ‘more’ is /mɔ:/ and ‘or’ is /ɔ:/. The third section of this video gives a good explanation of when you do and don’t pronounce the R in British English. The problem is understanding mother-tongue British-English speakers. You don’t have to sound like a mother-tongue English speaker to speak good English and make yourself understood, but you might have to work with them, and understand them. So far we’ve looked at the individual sounds in words and how we put them together to make words. Now we’re going to look at what happens to sounds when you put them together in longer words, and then at what happens to words in sentences. Words have syllables. A syllable has one vowel sound, with or without surrounding consonants. Don’t confuse this with the Italian ‘sillabare‘, which is more similar in meaning to ‘spelling’. Words can have one syllable, like ‘can’, ‘work’, ‘start’, ‘bread’. In longer English words, as in Italian, there is always one syllable that is stressed (shown in bold in the examples below). Two syllables: hun|gry, wa|ter, a|gain, ba|loon, en|ter, etc. Three syllables: ba|na|na, con|fe|rence, di|ffi|cult, e|xer|cise, dan|ger|ous, e|quip|ment, etc. More than three syllables: ob|li|ga|tion, te|le|vi|sion, etc. Note: in the phonemic transcription of words of more than one syllable, the stress is shown by an apostrophe (‘) before the stressed syllable: difficult /’difikəlt/, television /telə’viʒən/, again /ə’gen/. There are a lot of words that are similar in English and Italian, including false friends (words with similar spelling and origins but different meanings). BE CAREFUL: the stressed syllable is often different. The syllables that are not stressed often have a short, weak vowel sound. Unlike in Italian, where all the vowels sounds are given equal importance, only the stressed syllable has a distinct, specific sound. The most common weak sounds are /ə/ and /i/. Often the stress in a multi-syllable word will change according to whether it’s a verb, a noun or an adjective. Make sure you make a note of the stress on the different grammatical forms of a word. Multi-syllable words contain stressed and weak syllables. In English, the stressed syllable is noticeably louder and longer than the unstressed syllables. We’ve also seen that in words that contain pairs of consonants, like ‘equipment’ and ‘apartment’, the first consonant might disappear. The same kind of thing happens in sentences: when we put words together in sentences, certain words are stressed, and others are unstressed. For students of English it can sometimes be very hard to hear the unstressed words at all. In English it can be difficult to distinguish between individual sounds in words, and it can also be difficult to distinguish between individual words in sentences. Strange things happen to individual sounds when we put words together in sentences. Consonants disappear or change, or travel to the beginning of the next word. Below are some examples of sentences with disappearing, changing and travelling consonants. TIP: If you want to hear what the phrases below sound like, go to the demonstration page at Oddcast and copy or type in the sentences. 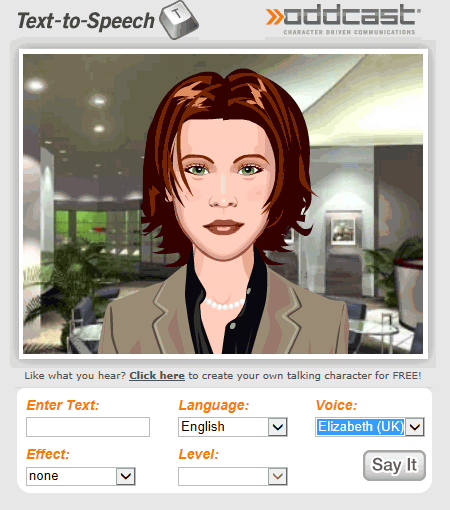 If you want the avatar to say the sentences with an English accent, find a UK voice under the ‘voice’ option. We’ve looked at the pronunciation of individual sounds, at word stress in words with more than one syllable, and at the pronunciation of words in sentences. 1. When you learn a new word, focus first on the pronunciation, then on the spelling. Check the pronunciation at Cambridge dictionary or WordReference. What is the main vowel sound? How many vowel sounds are there? Are there any weak vowel sounds? What are the consonant sounds? How many syllables are there? If the word has more than one syllable, which syllable is stressed? Is the spelling of the word confusing or helpful? If the word you learn has different grammatical forms – noun, verb, adjective, person – check where the stress is in the different forms. Don’t forget to say the word out loud a few times – get used to the movements your mouth needs to make the sounds. The best way to improve your pronunciation of connected speech is to copy the speech of native speakers. Listening and repeating is a repetitive, mechanical exercise that trains you to make the right English sounds in the right sequence. It’s often more useful if the sentences you are listening to and repeating are nonsense. You just need to pay attention to the sound, not to the meaning of what you’re saying. Do you like singing along to your favourite music? On YouTube you can find karaoke versions of most popular music. I recommend songs by The Beatles, such as ‘I am the Walrus‘ (or here for a normal version with subtitles) and ‘Strawberry Fields Forever‘ (or here for a normal version with subtitles) because the lyrics are nonsense, but the words are pronounced very clearly. This is an excellent way of practicing connected speech. Manythings.org is a great online resource. The accent in the exercises is American English, but it is still excellent practice. Their daily pronunciation practice page has a ‘listen and repeat machine’, and this page contains a lot of 10 minute listen and repeat exercises. Also, have listened to all the videos in the first part of this article, and repeated the sounds? They are a good way to practise your pronunciation and train your mouth – and then return here in a few days and repeat the exercises. As with understanding different English accents, the best way to improve your comprehension of spoken English is to listen to it as much as possible. TV and the internet provide plenty of opportunities for this. Here are some tips for listening in English. Watch TV programmes (TV series, reality TV shows, anything that interests you) in English with subtitles. You are probably not used to subtitles, but in countries like Belgium, Holland and most Scandinavian countries people grow up listening to enormous amounts of English on TV, with subtitles in their own language. People from these countries usually speak excellent English as a result. With Italian subtitles you can always understand what’s happening and what people are saying. You can also see how expressions are translated into Italian. With English subtitles you can learn an enormous amount about pronunciation, in particular, the relationship between the spelling of a word and the sound, and what words sound like when they’re in a sentence together. You can listen to the talks with or without subtitles. 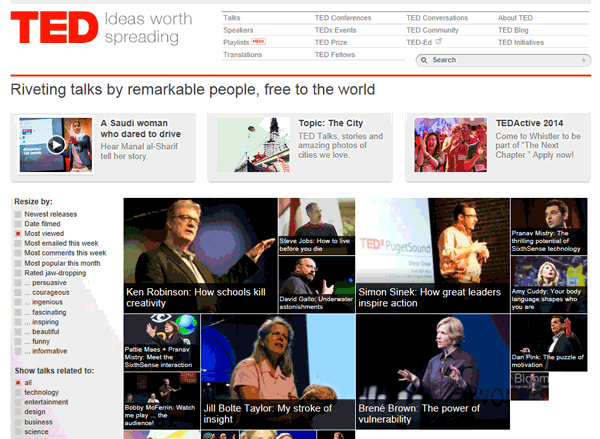 You can listen to the talks with subtitles in your own language or in English. You can read the transcript as you listen; if you click on any part of the transcript it will take you to that point on the video. You can download the talks and listen to them offline. Other great listening resources are newsy.com, the BBC mini audio-series called English at Work, and the short news stories at BBC six minute English. If you adopt some of the strategies above and get into the habit of focusing on the sounds in a word, and on the sounds of connected speech, you will notice a big improvement in your pronunciation of English and in your understanding of spoken English. You should feel much more confident speaking English. What do you think will work best for you? Which of these pronunciation tips did you find the most helpful? Is there anything that could be clearer? Please let us know in the comments section below – and if you think your friends need some help with their English pronunciation, why not help them out and share this post!